Hello there! Our friends from Xverify certainly deserve your attention when it comes to cleaning and verifying your data, thus we are happy to present a guest post by their lovely Senior Account Manager Ms. Krista Barrack. Without further ado – Xverify! Consistent inbox email deliverability is every email marketer’s dream. Yet, it’s not something that is easy to accomplish. Many email service platforms promise great out of the box delivery performance, but they always tend to fall short. So, what is the missing piece of the puzzle here? It’s following the rules of the road that is necessary to get good performance, and those rules are up to the marketer to follow. Think about when you drive your car. If you want to be a safe driver you must follow the rules of the road. Maybe almost anyone can drive, but if you want to drive legally you need a license. Your license is proof that you are familiar with the rules of the road. If you don’t want to get a ticket, then you make sure you are abiding by the speed limit and looking out for stop signs. Following the rules mean that you are a safe driver, but once you start to break or bend the rules, accidents can happen. Your goal is to cruise safely to your destination without getting fines, or fender benders. The same concept applies to email deliverability. If you are following the rules of the road your email will arrive safely at its destination. When you don’t follow the rules, you will hit a lot of speed bumps along the way. For example, if you just set up your email server and start blasting out emails you will get a flat tire (blacklistings). If you start sending too frequently to your users, you will get a ticket (spam complaints). The idea here is that you want to avoid these pitfalls and do things right the first time. 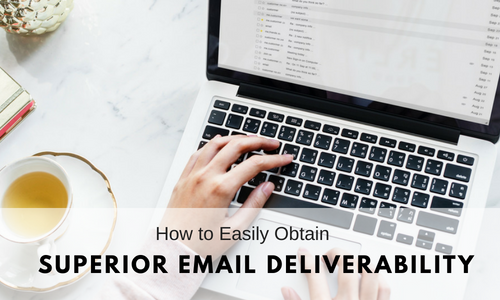 We are going to cover some of the most important rules of sending to help you set yourself up for superior email deliverability. Whenever you move to a new server or new email platform you cannot just simply load in your data and start batch blasting. You are going to burn up your reputation. Instead, you need to take the time to warm up your IP addresses. Warming up your IP address is the process of getting mail servers familiar with you. It allows them to evaluate your content and see how their user-base is interacting with your messages. You have to gain their trust if you want to have top-notch email deliverability. If you don’t start by sending slowly they are going to automatically filter your messages into the spam folder or block them all together. This is because you have not proven yourself worthy yet in the eyes of the ISPs. Don’t get discouraged because it is a slow process. Hence the reason we titled this ‘gently warm’. The typical process can take between 4-6 weeks. Want to learn more about IP Warming? Download the ultimate guide to warming your IPs. As exciting as it sounds to bring over your entire database to a new sending solution, don’t do it. Dirty data is a culprit for poor deliverability statistics. You are going to need to take the time to invest in cleansing your data to remove invalid records before importing them. This way you can avoid hard bounces when starting out with warming up and building your reputation. Bounces can do a lot of damage to your sender reputation. XVerify has a great email validator tool to help you clean your entire database. It goes through each individual email address to make sure the username is a real registered mailbox at the domain. The accuracy rate is 98% and it’s great at removing emails that would have generated hard bounces. On the plus side, it will also help you reduce your risk for spam complaints and hazardous email addresses associated with online fraud and chargebacks. The secret to solid email deliverability is reputation. There is a reason we keep saying it over and over again. That is because the ISPs need to trust you before they allow your messages to enter their user’s inbox. So how can you gauge your level of trust? You can do so by keeping an eye on your Sender Score. The Sender Score is often compared with a credit score. It’s hard to build up, but easy to get dings and cause your score to go down. The score ranges on a scale of 0 – 100. If your score is less than 70 you have a lot of work to do. Once your score is above 80 you have the green light. It’s recommended that you regularly monitor your score. If you notice your score falling then it’s time to track down what could be going wrong. The score is comprised of a handful of data points. Setting up your server for success plays a huge role in your mailing performance. Most of these issues can be avoided by gradually warming up your IPs and weeding out poor quality contacts from your database. By following these few steps, you will already be ahead of other mailers who are just getting started with their mailing server. If you are looking to improve your Sender Score, you need to look for ways to pump up your engagement rate. If users are enjoying the content you are sending, and they are opening and clicking your messages your score will increase. Another way to gain some bonus points is by requesting your users to whitelist your content. The key to long-term results is following recommended practices and staying consistent. Keep following the rules of the road and you will achieve superior deliverability results in due time.